Yeah, so I was sick. For like a day. I’m ok with that. See, I know everyone around me has gotten the flu, colds, the ‘Sapphire virus’, pink eye…whatever–you name it, they’ve had it this year. I have been trying to stay away from the illnesses. Saturday I was at the mall and could swallow one second and then had pain the next. It was that quick! I thought that I would be getting the flu, and who knows, there may still be time. But I pumped myself full of vitamin c, airborne, cold-eeze, and water. I even gave myself a positive self-pep talk. But I am feeling much better than I expected. I’ll just stay on the regimen of vitamination to make sure I keep the yucky away. After last week (I’ll just call it a constant party), I decided that I need to rest, so I stayed in last night. I worked on the Fitted Knits V-Neck pullover. Here you can see the progress on the endless ribbing. I think I am supposed to do 10 inches of ribbing…we’ll see if I last that long. I might go back to the sleeves and come back! My cousin’s wife is from Romania, and she was watching me knit at Easter dinner. She told me that I did it differently than her, which is probably true. I knit English, so I am sure she does Continental…which I really need to learn and practice. I want to knit fast! 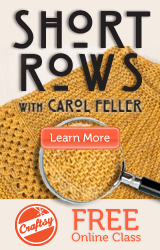 Maybe this year at Stitches I’ll take that class…hmm….